Eleutherodactylus Duméril & Bibron, 1841: in Roret, Suite à Buffon (Erpét. ), 8: 620. Rodríguez, A., Dugo-Cota, Á., Montero-Mendieta, S., Gonzalez-Voyer, A., Bosch, R.A., Vences, M. & Vilà, C. 2017. Cryptic within cryptic: genetics, morphometrics, and bioacoustics delimitate a new species of Eleutherodactylus (Anura: Eleutherodactylidae) from Eastern Cuba. Zootaxa 4221(5): 501–522. doi: 10.11646/zootaxa.4221.5.1. Reference page. Frost, Darrel R. 2018. 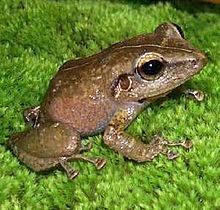 Amphibian Species of the World: an Online Reference. Version 6.0. Electronic Database accessible at http://research.amnh.org/herpetology/amphibia/index.html. American Museum of Natural History, New York, USA. Eleutherodactylus . Accessed on 10 May 2015. This page was last edited on 1 April 2019, at 14:51.